All patterns are instant download! 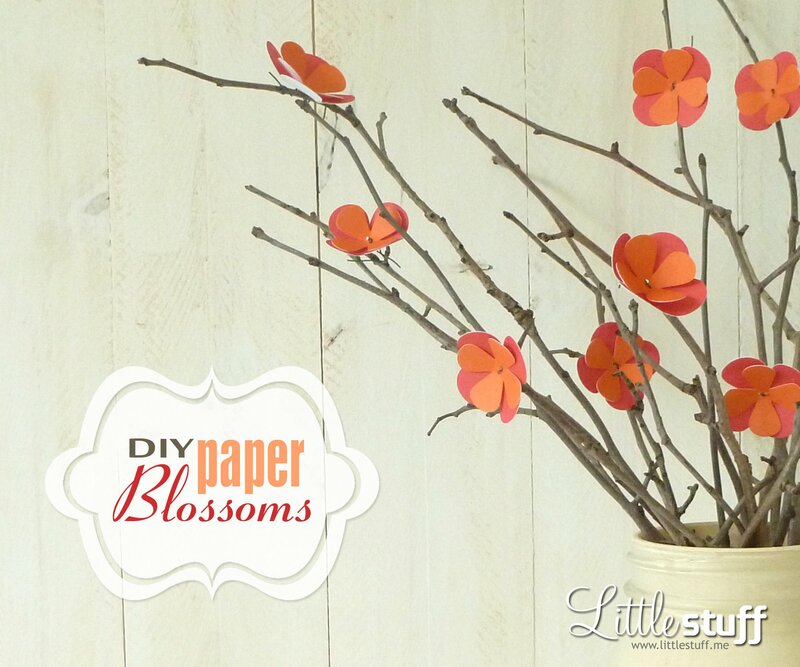 These cheery paper blossoms attached to the ends of twigs are a simple yet elegant DIY project that won’t take a lot of time or resources to put together. They are great for home décor, wedding centerpieces, bridal shower decor, and so much more. RECOMMENDED: An electronic digital cutter, preferably a Silhouette so that you can make use of my free Silhouette Studio cut files at the end of this post. OPTIONAL: If you don’t have an electronic digital cutter, you’ll need a pair of scissors, a fat needle, and a great deal of patience to cut out the paper blossoms. I started by painting a mason jar with a soft ivory craft paint. I chose to use the method where you pour paint inside and swirl it around, then turn the jar upside down to get the paint right to the top edge. There are many tutorials on how to do this, so I won’t describe it in detail, but I will suggest that you leave it a full two-three days to dry. For the blossoms themselves I chose to use two colors that were close in shade and tone, somewhere in the neighbourhood of coral. I cut them out with my Silhouette SD digital cutter using a two graphics I designed in CorelDraw — an outer layer and a slightly smaller inner layer. The Silhouette Studio 3 files are available for free download at the end of this post. Don’t have a digital cutter? You can alternately print the outlines of the blossoms onto your card stock or scrapbook paper, and hand cut them. A PDF is available for download at the end of this blog post for that purpose. Be aware that many of the tiny holes in the center of the blossoms will be left behind on your cutting mat. It’s a bit tedious, but you can scrape them off with your fingernail, or gently wash them off and wait for your mat to dry. Next I cut florist wire into 2 inch (5 cm) lengths. I folded the florist wire in half and inserted it through the holes in the center of the inner and outer blossom pieces. If you are cutting by hand, you will need to make the center holes manually. I suggest lining up the inner and outer piece and puncturing them at the same time with a fat needle. Depending on the size of your needle, you might need to work it around a little to make the holes wide enough for the florist wire to fit through. Make sure the blossoms are lined up so that the inner and outer pedals are staggered, rather than aligned — it will give your blossom a rounder look. With your fingers gently fold your blossom into a slightly cupped shape. To attach blossoms to twigs, wrap the florist wire two or three times as snugly as possible around the branches. I found it helpful to arrange the branches in the jar before attaching the blossoms so that I could spread out the flowers aesthetically.